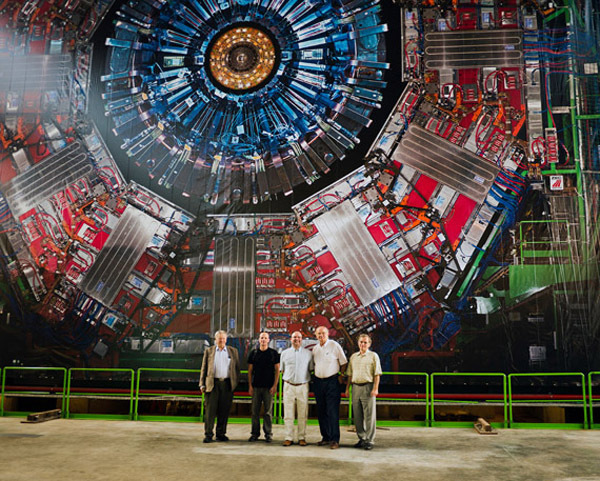 July 4, 2012, was an historic day in science with researchers at CERN (European Organization for Nuclear Research) announcing the discovery of a new particle that is “consistent with the Higgs boson.” It also marked an important period at the University of Rochester as three physicists and an engineer helped support the nearly five-decades-old theory of one of their colleagues. 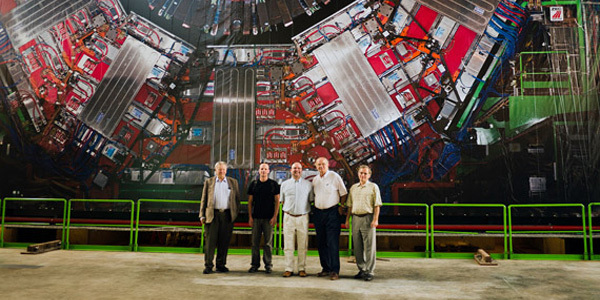 The four scientists—Arie Bodek, Regina Demina, Aran Garcia-Bellido, and Sergei Korjenevski—were part of CMS, one of the two experimental teams at CERN whose results made the discovery possible. Carl Hagen—along with Gerald Guralnik and Thomas Kibble—wrote the 1964 paper, titled Global Conservation Laws and Massless Particles, which was named one of the milestone papers in the history of Physical Review Letters. Hagen, Guralnik, and Kibble were among the six scientists who came out with similar papers that year describing the Higgs mechanism and the Higgs boson. The Higgs boson is an elementary particle that’s responsible for giving other particles their mass. Arie Bodek, the George E. Pake Professor of Physics, calls the news from CERN the “most important discovery in particle physics since the ’70s.” Bodek’s 1972 Ph.D. thesis at MIT involved the discovery of the quark, which he considers the first experimental result that led to the formulation of the Standard Model of particle physics. Bodek’s research group at the University of Rochester took the lead in constructing the detectors, called “hadron calorimeters,” for the CMS experiment. “I feel very fortunate to have participated in both of these incredible discoveries,” said Bodek. Professor of Physics Regina Demina, who said she long wanted to be part of the high-energy physics frontier, has been involved with CMS for nearly 12 years. Aran Garcia-Bellido, assistant professor physics, has been a member of the CMS team since 1994. His particular group works in the operations and upgrade of the hadron calorimeter. The work at CERN would not have been possible without a great many people working at a high level of quality, according to Demina. Among those people is Senior Technical Associate Sergei Korjenevski, an engineer who’s responsible for maintaining the quality of the silicon sensors in the CMS detector. Korjenevski worked on the CMS project for 11 years, his tenure coming to an end in 2010 after the successful commissioning of the detector. He hopes that the discovery of the particle marks the beginning of a new era in our understanding of reality. As work continues at CERN, a new generation from Rochester is busy leaving its mark. Roberto Covarelli, a postdoctoral fellow under the supervision of Demina, is involved in measuring the spin of the new particle, which, if it is truly the elusive Higgs boson, will be zero.